SCOB - Science Centre OBservatory: What's up this week! Its Friday again and another week has gone by. I didn't quite get round to posting more blogs and the installation of the air-con seems to have stalled, which is quite annoying. I guess our dear fans will be able to enjoy a few more weeks of service before the A/C is operational. Although we are looking forward to using the air-con with great anticipation, there is something to be said for the noble fan. For one, it uses alot less energy and in these times of global warming that's quite a plus. Ok so it doesn't cool you down as well as the high energy consuming air-con but its a better friend to the environment. Having said that, I'd wish they'd hurry up and install that energy hungry beast in the observatory so we can have slightly cooler Friday nights, heehee :-). Its not as eco friendly as a fan but it sure is cooler and its only for two hours a week, not that bad right? Anyway, at home the fan is still my friend. I barely use air-con anymore and only use one fan when sleeping. As a result my utilities bill has come right down, which makes me very happy :0D. So that's my message of the week, a good way to look after our Earth is to find the right moviation...i.e. saving money. Reduce your electricity bill, get some spare cash and help the environment whether it was your intention to or not. Back to our main business, Astronomy. I was hoping to start a regular series of posts regarding what we'll be expecting to look at each week including a starmap for the month so I'll start with tonight. Just like last week our main highlight will be the planet Saturn. 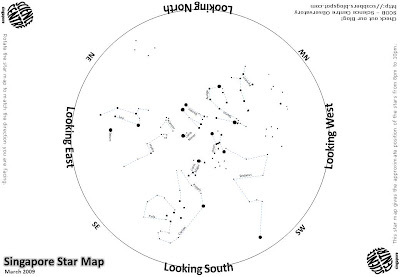 If there is time and it is clear enough we may look for some interesting star clusters also. For example, the Beehive cluster, M44 in Cancer. Slightly more ambitious will be the Eta Carinae nebula in Carina, difficult because it lies low in the south where there tends to be alot of light pollution. Of course we should be able to see the Orion Nebula, M42 again as Orion descend lower toward the Western horizon. You might notice that it is on its side, that is because we are in Singapore, near the equator and therefore standing on the side of the Earth giving us a sideways view of objects in the sky. Saturn will only appear right side up when its directly overhead. That's all for now. Look out for more updates for April next week.